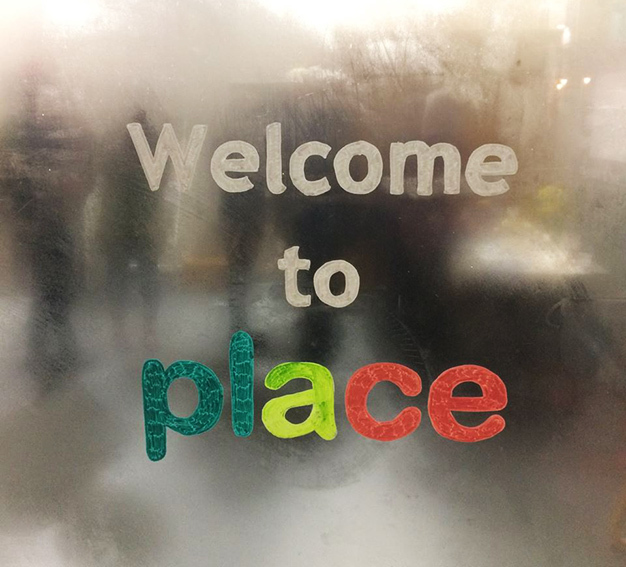 Thanks to everyone who came along to the launch of Place on Thursday 25 January, our new hub for community-led art and culture at 25 Avenue C, Sneinton Market. A mix of local people, artists and city organisations attended the launch, with over 77 people coming along in total. The event included the unveiling of a new book celebrating our recent Sneinton Pride of Place exhibition with the Caravan Gallery – and it was great to have Jan Williams and Chris Teasdale from the Caravan Gallery as special guests. Local people contributed stories, photos and memorabilia to the exhibition, to tell the story of Sneinton, and nearly all the contributors attended the launch, where they were presented with a free copy of the Sneinton Pride of Place Project book. It was very well received, with people commenting on the quality of the project and the book. If you’d like a copy – it’s available at Five Leaves Bookshop and the Shop at Sneinton Market – for £7.50. The launch also saw us announce the phrase that will be immortalised in a new neon artwork for Sneinton Market, following a public vote. The winning phrase was ‘Be remarkable’ and you’ll be able to see the new artwork in all its glory from Light Night on Friday 23 February – at Place – thanks to funding from Nottingham City Council’s Nottingham Together fund. The neon artwork is the result of a live art event we held last summer, as part of Nottingham’s Street Art Festival, where local people were invited to answer the question, ‘Before I die I want to…’ with answers written on a chalkboard wall. The project was inspired by a global public art project launched by artist Candy Chang, that’s featured in over 70 countries! The idea behind Place is to bring art and culture of the very highest quality to the heart of the community, with local people being the driving force behind new artworks, events and activities for the area. Place will also be a one-stop-shop for local people to find out more and get involved with art and culture activities across the city, while supporting local artists and up-and-coming talent in the area. Together with students and volunteers keen to gain experience of managing and producing arts projects and events. Place projects in the pipeline include local activities and ticket offers leading up to Nottingham’s first Puppet Festival in March. A range of Nottingham arts organisations are involved in Place, including Nottingham Contemporary, New Art Exchange, City Arts, Dance4, Surface Gallery and Backlit Gallery. The Sneinton Pride of Place Project book was funded by the Big Lottery Fund’s Awards for All. Place is being supported by Arts Council England, through the National Lottery.